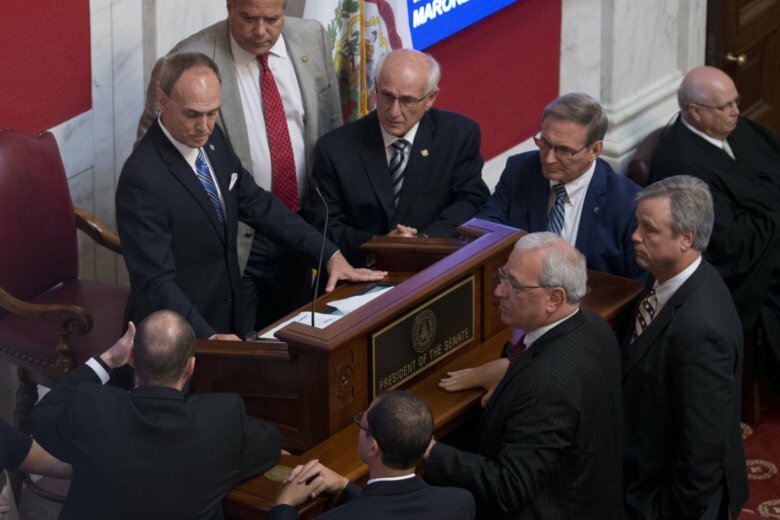 CHARLESTON, W.Va. (AP) — The first of four West Virginia Supreme Court justices to be tried on impeachment charges testified Monday that she shouldn’t be standing trial. Walker is among four justices impeached by the House of Delegates in August. The cases targeted spending, including renovations to the justices’ offices, and also raised questions about corruption, incompetence and neglect of duty earlier this decade. The House impeached Walker and justices Robin Davis, Margaret Workman and Allen Loughry on a charge of abusing their authority. It said they failed to control office expenses, including more than $1 million in renovations to their individual offices, and not maintaining policies over matters such as working lunches and the use of state vehicles and office computers at home. It’s the only impeachment count Walker faces. The House chose not to impeach her for spending $131,000 on office renovations, far less than what some other justices spent. Supreme Court finance director Sue Racer-Troy testified Walker’s office lacked furniture upon joining the court in 2017 because her predecessor had purchased many of those items. Walker also had complained about the lack of lighting in the office. Walker said she knew of no administrative policies to address excessive spending. When pressed by House judiciary chairman and lead trial prosecutor John Shott, who pointed out that a sink mirror in her office bathroom cost $725, Walker said she “absolutely” should have paid more attention to those costs as they occurred. Walker gave mostly short but direct answers in a calm tone when questioned by Shott, who led earlier impeachment proceedings in the House of Delegates and had worked out a settlement agreement to have her charge dropped before the Senate rejected the offer last month. During a lunch break, Walker was smiling and courteous as she walked into the Capitol’s basement cafeteria. Later she gave lengthy answers during questioning by her attorney, Mike Hissam. Much of Shott’s questioning was directed at the court’s longstanding policy of taxpayer-paid working lunches at high-end restaurants. “You will not see an invoice from McDonald’s, from Wendy’s, from Arby’s,” Shott said. According to trial exhibits, from January through November 2017 the court bought 602 meals on 52 separate days for the justices and various staff members at a cost of $10,096. With tips, the average lunch cost $16.77. Walker said she learned in early 2017 that Davis stopped participating in the lunches. On Dec. 29, after Charleston television station WCHS-TV made a Freedom of Information Act request that drew attention to the lunches, Walker reimbursed the state $2,019, or one-fifth of the lunches’ costs. Walker said she saw nothing illegal in the lunches, but “I didn’t want taxpayers buying my lunch. It took me too long to come to that realization,” she testified. As her testimony closed, Walker apologized to the senators who are serving as jurors for taking up their time. Trials also are set later this month for Workman and Davis and next month for Loughry, whose federal trial on a 25-count indictment is set to start this week. The federal indictment alleges, in part, that Loughry repeatedly lied about using his office for personal gain. Lawmakers approved a total of seven impeachment articles against Loughry, four against Davis and three against Workman. Davis announced her retirement shortly after her impeachment. The Senate rejected a resolution that would have dropped charges against her. U.S. Rep. Evan Jenkins and former House Speaker Tim Armstead have been appointed to serve as temporary justices until a Nov. 6 special election to replace Ketchum and Davis. Jenkins and Armstead are among 20 total candidates seeking those seats.